I believe that prayer works. That it’s powerful and effective. Prayers may not always be answered the way we would like, if at all, but they will always bring us closer to The One who has the power to change a situation. With this understanding, I find myself praying often for Jody’s upcoming transplant. There are many aspects of the journey we are about to take that I desire to cover in prayer, and sometimes it feels overwhelming. Recently I had the idea to write down all the prayer requests I could think of and pray for one specific area each day. I know that some of you are faithful in keeping us in your prayers, so the more I thought of it, I decided to share my prayer list with you. Why not turn it into a prayer challenge? The month of June is just around the corner, which seems like the perfect time to start. 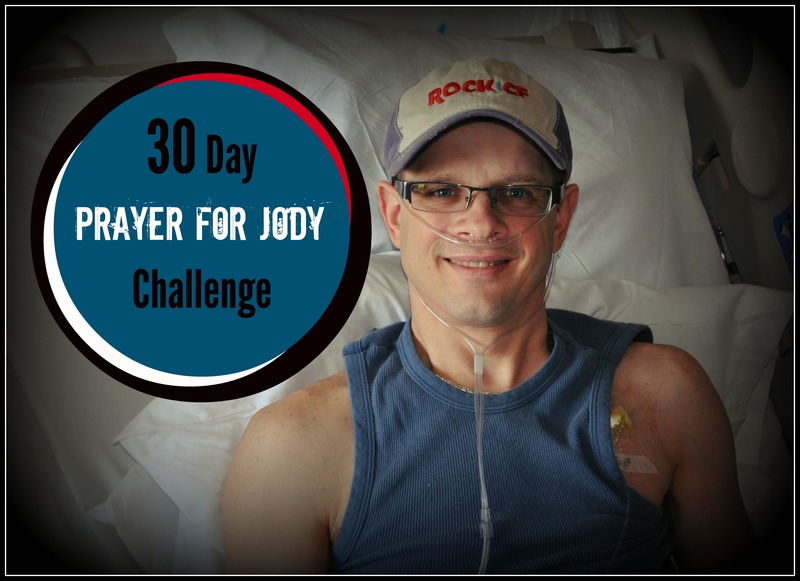 Will you join me in a 30 day “Prayer for Jody” challenge? Below I have listed a prayer focus (request) for each day of the upcoming month. Please consider supporting Jody and my family by giving us the gift of prayer each day for the month of June. It’s free, easy, and perhaps God will use this time to speak to you about an area of your life as well. If you accept this challenge, hit the “print” button at the bottom of the post for a print-out which can be hung in a place where you will see it often (the refrigerator, your desk, your car, etc.). One can never have too many people praying for them so please share this post with the prayer warriors in your life, and ask them to join us in covering all aspects of Jody’s transplant in prayer. 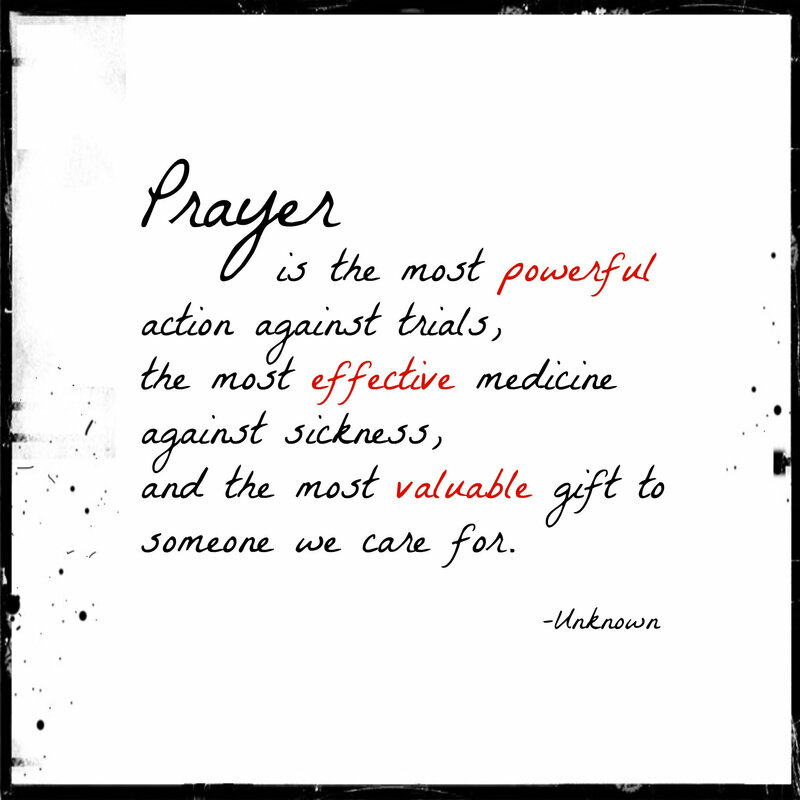 Make a difference, and give the gift of prayer! Health Today – Pray for Jody’s current health as he awaits transplant. Pray against any infections that would cause a rapid deterioration before transplant. Jody’s doctors believe that in his current state it wouldn’t take much for him to go downhill fast. Additionally, if he needed to be on a ventilator for an extended period of time prior to transplant, it would disqualify him from being able to have the operation at all. The healthier he is going into his transplant, the better his recovery will be, so pray for protection over his lungs and overall health until the time comes. The Donor – Pray for Jody’s donor who is, at present, living and breathing. Pray that he/she would know Jesus as their personal Savior & Friend. Pray that they would make the most of their time left, not taking a moment for granted. Also remember to include prayers for the donor’s family as they will be forced to make the decision of whether or not to give the gift of life. This family will also need your prayers as they grieve the very sad, and unexpected loss of a loved one. The Call – Pray that we will be ready when Jody gets the call for his transplant. Pray that we won’t be too far from home and that we’ll have time to grab a few last-minute items (things that couldn’t be packed ahead of time). Pray that the drive will be uneventful and that we won’t be held up in traffic like before. Pray also for a supernatural peace/calmness when the call comes. Emotions – This journey has, and will continue to be an emotional roller coaster. Pray against negative thoughts and feelings, such as fear, hopelessness, doubt, worry, anxiety, offense, etc. Instead, pray that we would be filled with peace, strength, faith, hope, trust, courage, etc. Fundraising Efforts – While Jody and I are primarily focused on his health (and will continue to be post-transplant), there is a team of people working behind the scenes to help us with fundraising. Jody’s transplant, recovery, and post-op medications (just to name a few) will be a financial burden on us. This team of volunteers is working to eliminate that burden by fundraising on our behalf. While this is a huge blessing to us, it puts a lot of work & responsibility on them. Pray that people would respond to their call for help and support, particularly with planning an upcoming auction in the fall. Pray that the team would feel encouraged and that their efforts would be rewarded. Pray also that people would continue to give financially so we can reach our fundraising goal set by Jody’s transplant social worker. Finally, pray blessings over those who have already offered time, services, and/or financial help. Pre-Op – Pray for the period of time between our arrival at Hopkins and when Jody is taken to the operating room. He will undergo a few tests during this time. Pray that anxiety would be minimal and courage and peace would be plenty. Our Families – Pray for our families, particularly our Moms, whose primary role in all of this will be to take care of our two daughters. It’s one thing for a Grandparent to babysit here and there, but it’s another thing for them to care for young, energetic kids for weeks on end with no break. Pray for strength, endurance, and patience too. Also pray blessings on them as they give of themselves in such a big way to help us through this time in our lives. The Surgery – Pray for the surgeon, anesthesiologist and other team members who will be caring for Jody during the actual transplant. Pray that Jody’s old lungs will tolerate the surgery so that he won’t need to be placed on a heart/lung machine during the procedure. Pray that God would guide the surgeon’s hands, preventing any errors from occurring. Pray that the surgery would be uneventful (progressing as smoothly as planned), uncomplicated, and a complete success. Pray that God would send His angels to protect and comfort Jody during this big operation. Also pray for me as I anxiously await updates and for the time when I see him for the first time post-op (he will be sedated and on a ventilator). Our Girls – Disease impacts an entire family, not just one person, and our girls are no different. Tabitha, age 5, misses how her Daddy used to be able to run around with her, and take her and her sister to fun places, like Dutch Wonderland. Words like oxygen, germs, infection, lungs, sick, sanitizer, hospital, etc., are an every-day part of her speech and play. She has a very basic understanding of what is happening with Jody. Piper, our 3 year-old, really has very little understanding if at all. Our girls are accustomed to Jody being around nearly 24/7 so they notice and miss him when he’s ill or hospitalized. Transplant separation could range from weeks to months so pray for our girls as they experience a temporary change to the life they’ve always known (since both Jody and I will be away much of the time and they will be staying with grandparents). Pray for safety over them while we are separated, and that they come out of this experience emotionally strong, whatever the outcome. Against Rejection – Pray that Jody’s body would accept the lungs from his donor as if they were his own. Pray for a perfect match! Pray against rejection. Pray against the many unpleasant side effects of high doses of anti-rejection drugs. Recovery – Pray for Jody as he begins the long road to recovery. Pray for minimal pain, and few (if any) complications. Pray that I will be an effective cheerleader, encouraging him on in his recovery. Tiffany – Please pray for me as my role of caregiver takes on a whole new level. As Jody recovers I will be balancing both caregiving and life outside of the hospital (work, kids, home responsibilities, bills, dealing with insurance companies, etc…). I know this will be a busy and stressful time for me so pray for strength to make it through. Please also pray for my health both now and then. One fear I have is that I will be sick or have a cold when Jody gets his transplant. Even the slightest cold would prevent me from being able to be by his side, and this would be devastating for me. After Jody’s transplant, and for as long as he is in the hospital (I think) I will need to wear a plastic gown, gloves and mask (including to sleep, if I am even allowed to stay overnight with him). This can be quite hot and annoying if I’m honest. Pray that this “garb” would not faze me and that I would be comfortable at Jody’s bedside. Help – This upcoming lung transplant feels like a big, all-consuming mountain to climb. This mountain may not seem quite as large if we have people standing by us, cheering us on, and helping us along the way. Pray that God would provide those supporters when we need them the most. Pray also that when we are unable, our physical/practical needs will be met as well. Pray that we can be humble enough to accept the help when it is offered. Finally, pray blessings on those who sacrificially give of themselves by offering help and support. The Doctors – Jody will have a team of physicians managing his care. Pray wisdom on them to make the right decisions and for answers when they question the right thing to do. Pray for doctors who are kind, thorough, and willing to explain and teach Jody’s plan of care on a level we can understand. Positivity – Throughout this experience there will most likely be set-backs. Pray that we can remain positive in our thinking, keeping our eye on the end goal. Breathing – Pray that Jody’s time on a ventilator after surgery will be short and that there are no complications that would hinder his ability to breathe on his own. Pray that his lung function will steadily climb so that he can be off oxygen support and breathing easily and comfortably on his own. The Nurses – Nurses can make or break a hospital experience! Pray for the nurses who will be caring for Jody throughout his hospital stay. Pray that they are top-notch, great at what they do, but also warm and friendly. I remember thinking from past ICU hospitalizations that the critical care nurses tended to be much less warm and fuzzy (compared to regular med-surg nurses), even seeming annoyed when questioned. Pray against this, and that the nurses Jody is assigned will be great teachers, and will see him as the person (husband, father, son, brother, friend) that he is, and not just another patient. Lastly, pray that I would connect with Jody’s nursing team as well. Chest Tubes – Following his transplant, Jody will have four chest tubes which will remain in place to allow for drainage from his lungs. I have heard that they can be quite uncomfortable and even painful. I’ve also read stories of people needing to stay in the hospital for months after transplant, waiting for the tubes to stop draining so they can be pulled. Chest tubes can also get “clogged” resulting in a back-up of fluid, causing shortness of breath. Please pray against any complications related to these tubes. Rehab – After transplant an important aspect to Jody’s recovery will be pulmonary rehab (guided exercise). Pray for strength and determination to “get moving.” Pray for minimal pain during these exercise sessions. Pray for a connection with the therapists with whom he will be spending a lot of time. Tiffany’s Job – Pray that my managers will be understanding of my situation, and willing to work with me. We do not have a lot of flexibility with our schedules at work (and they are made up eight weeks in advance). Pray that it would work out more often than not that Jody’s appointments fall on my days off (I work three days a week and do not have a set schedule). Pray that if I need off on a day that I am scheduled to work, I would be able to find someone willing to make a switch with me. Pray that I do not run out of FMLA time throughout the next year. Finally, pray for my emotions when I must work. Leaving Jody’s (hospital) bedside to go to work is one of the hardest things I do, and I know it will be even harder after his transplant. Pray that I can stay positive and focused on the task at hand, despite everything happening in my life outside of work. Rest – It’s hard to get quality sleep in a hospital when interruptions are frequent. Pray that Jody would be comfortable and able to get the sleep he needs to wake up feeling well rested. Unnecessary stress – As we focus on Jody and his recovery after transplant, pray that our lives outside of the hospital will be guarded. Pray against things breaking down at home or with our vehicles. Pray against any of us getting sick. I can dream up all kinds of scenarios of things, completely unrelated to transplant, that could go wrong (the dog gets sick, a pipe breaks, a tooth cracks, the girls get sick, etc.). This would only add unnecessary stress. Pray that life apart from transplant will run as smoothly as possible during this intense time. Miracle – Receiving a new set of lungs will be, in and of itself, a miracle in Jody’s life. Right now, without this gift of life, his life expectancy is 1-2 years. As before, pray that Jody’s body would miraculously accept these new lungs as if they were his own. Pray that God would use this surgery to bring the earthly healing we’ve been asking for. Pray for a miracle! Germs – Being immunosuppressed post-transplant, germs, viruses and bacteria could be a real threat to Jody’s life. Frankly I am terrified of how we will keep Jody healthy when we have preschool/school age children who bring illness into our home. Even now it puts me in freak-out mode when I know they have a cold, and risk sharing it with Jody. Sadly, I imagine this will only get worse. Please pray for supernatural protection from the germs that will surround our family and Jody in particular, following transplant. Pray also for protection over him this upcoming cold/flu season. Safe Travels – Post transplant Hopkins will become a second home for us. In choosing not to relocate to Baltimore (as was first suggested), we will be making many trips back and forth between our house and the hospital. This 82 mile (one way) drive on a busy highway is sure to provide ample opportunity for something to go wrong. Once already during this trip our vehicle was damaged because of accident debris left on the road. This is one stress we hope to avoid. Please pray for safety while spending so much time on the road traveling to and from hospital visits and doctors appointments. Learning – This transplant and recovery will be unlike anything we have ever experienced. There will be a huge learning curve as we prepare to bring Jody home. Pray that we absorb and understand the education we are given so that we can follow through with his care at home properly. Against Statistics – If you’ve been reading my blog long you know that lung transplants are not known to have the best long-term outcomes. They are done more to improve quality of life, and not necessarily longevity. Fifty percent of patients do not live five years out of a lung transplant, and only 38% of people live 10 years out. In 10 years our daughters will be 13 & 15, and still very much in need of their father (perhaps at that age even more so than ever before). These statistics are very hard to accept, and wear on me emotionally. I often find it easier to believe the statistics than that God could have a different plan. Pray against this. Pray also that God’s plan for Jody’s life would be to beat the odds stacked against him, and to watch his girls become grown women. Acceptance – There are no guarantees in life. While we hope this transplant will be long-lasting, we understand that God may have a different plan. Pray that we can accept The Lords will for our life (whatever it may be) and trust in Him always. Jesus – Pray that throughout this journey we see the power, love, and goodness of God, especially in times of doubt. Pray for opportunities to share the love of Jesus with the people we meet. Pray that our faith would be strong. Pray that above all, God would receive all the glory. You choose – Is there an aspect of this journey that you feel compelled to pray about? Perhaps something that I’ve not considered? Was there an area this month that God laid on your heart to continue praying for? If so, take it to The Lord on our behalf. To those of you who completed this challenge, THANK YOU! It’s reassuring to know that Heaven was flooded with prayers for the success of Jody’s transplant. When the actual time comes, please continue to lift us up in prayer as we begin to climb the mountain set before us. We’re looking forward to “the sweet life” when we get to the other side, and we know that it will be your prayers helping us, encouraging us, and moving us forward on the journey. Will print this out and pray for your requests. You’re right, prayer does work!! Thinking of your entire family! the suggested things to focus our prayers on for your precious family! Wonderful idea. Our family will be praying. That is great Tiff…Jody, you are always in our thoughts. I have the highest hopes that you will beat the odds! Wishing you all a smooth road ahead! Thank you Tiffany & Jody…for allowing us the opportunity to journey with you. I look forward to hearing how God reveals himself as we pray so specifically. Great idea! Great idea Tiffany, I have printed it out and have it on my desk at work. I wil pray for all of the things you have listed and any other thing that comes to mind while I pray.